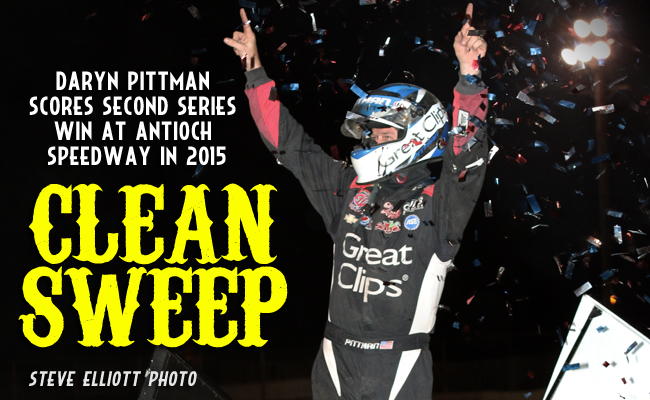 Daryn Pittman Sweeps Outlaws at Antioch :Racers Guide – The Web's #1 Racers' Online Directory! 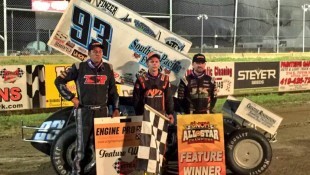 ANTIOCH, Calif. – Sept. 13, 2015 – Daryn Pittman picked up the 2015 Antioch Speedway sweep Sunday night after winning his second World of Outlaws Sprint Car Series feature of the season at the track. 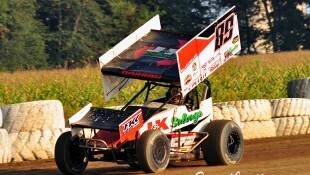 Pittman fought a hard battle past Joey Saldana and then held off him and Tyler Walker through the remaining laps of the feature. 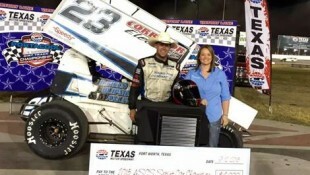 It was the fifth series win of the season for Pittman and his Kasey Kahne Racing with Mike Curb team. 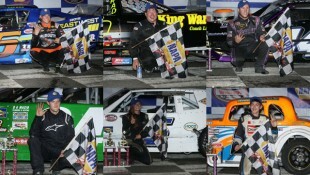 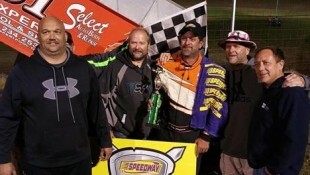 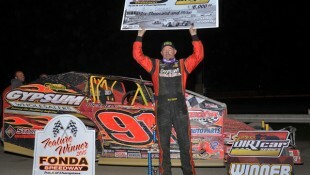 Pittman picked up the earlier win during the series’ appearance at Antioch on March 29. 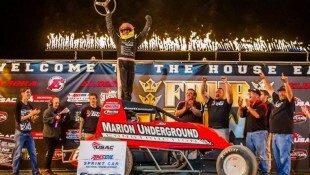 Saldana brought the field to the green flag and was wheel-to-wheel with Schatz through much of the first lap. 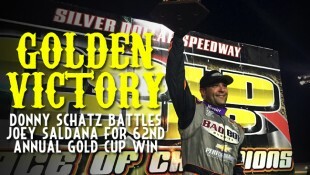 He held him off through the next three laps and then Schatz caught him again. 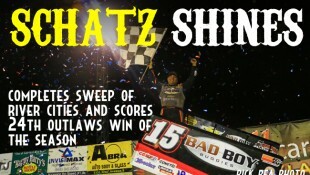 Side-by-side once again, Schatz battled past on the bottom of turn four to take the lead. 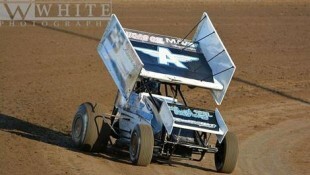 The move was short lived for Schatz though as rare bad luck struck. 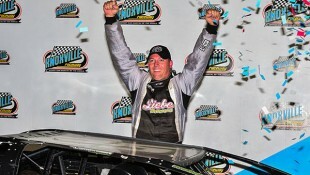 A flat right rear tire forced him to the work area on a lap nine caution. 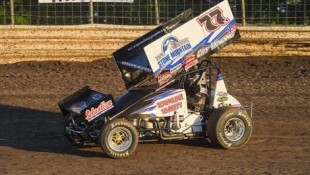 As he reentered the track at the tail end of the field, Joey Saldana took over the lead. 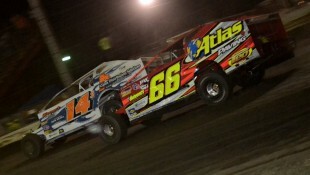 On the restart, Pittman looked to the lead as Tyler Walker took over second. 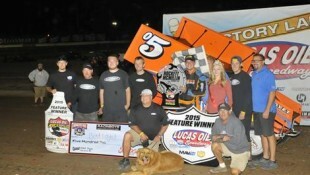 As Pittman built up a lead through the middle portion of the race, Saldana had his hands full with Walker. 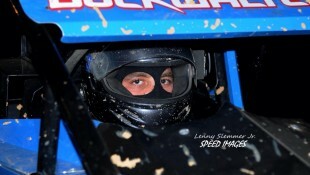 Pittman caught the back of the field on lap 19 and began working his way through traffic. 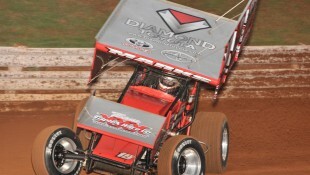 Two laps later, Walker finally found an opening and cleared Saldana as the two drove off of turn two. 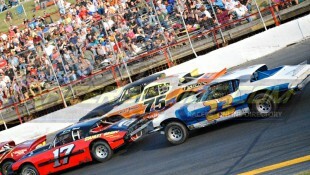 The next lap, the first of four late race cautions flew. 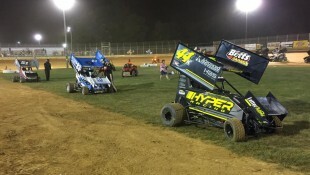 With Walker around, Saldana stayed close looking for a way around. 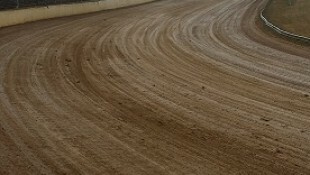 On lap 25, Saldana threw a slider on Walker in turns three and four, but Walker held the spot. 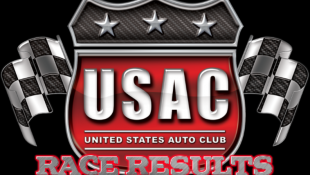 The final caution fell with three laps remaining. 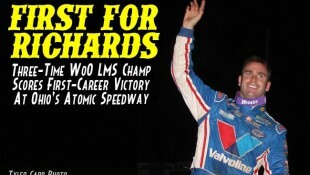 On the restart, Saldana got the opportunity he needed. 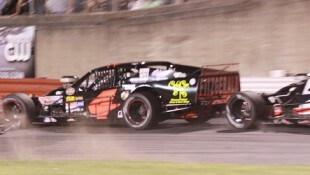 He worked the slider in three and four again, he missed the mark the first time, but battled past on the second attempt with two laps to go. 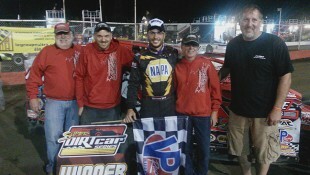 Pittman crossed the line first with Saldana, Walker, Sweet and Paul McMahan following. 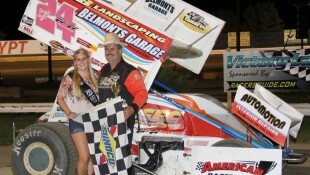 With his wife and two daughters in victory lane, Pittman thanked them for their support. 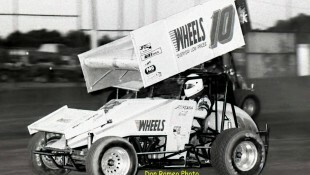 Saldana’s finish was his third straight second place finish. 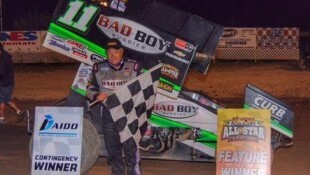 After two disappointing runs in his return with the World of Outlaws at the Gold Cup, a jubilant Walker thanked his Richie Rich Motorsports team. 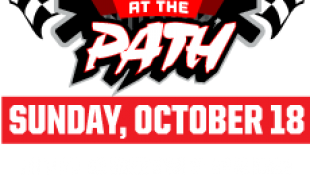 The World of Outlaws Sprint Car Series returns to action at Clay County Fair Speedway on Friday, Sept. 18 for the Arnold Motor Supply Shootout. 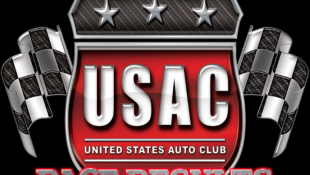 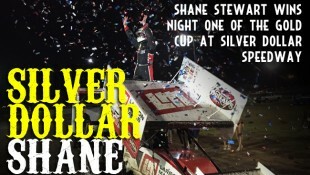 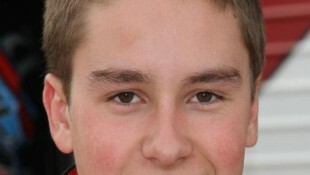 To find out more information and to learn how to buy tickets, visit http://woosprint.com/clay-county-fairgrounds. 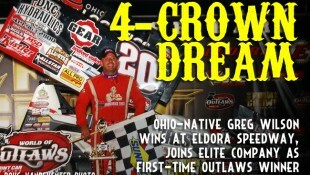 Follow the World of Outlaws Sprint Car Series on Twitter at www.twitter.com/WorldofOutlaws, like it on Facebook atwww.facebook.com/WorldofOutlaws, or check out the latest videos on YouTube at www.youtube.com/WorldofOutlaws. 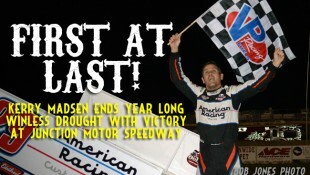 RACE NOTES: Daryn Pittman scored his fifth World of Outlaws Sprint Car Series victory of the season Sunday night at Antioch Speedway… Daryn Pittman swept the World of Outlaws Sprint Car Series features at Antioch this season…Joey Saldana picked up his third straight second place finish tonight with his run at Antioch Speedway… Rico Abreu picked up his fourth quick time tonight of the season with a qualifying lap of 11.489… Jason Sides was the night’s KSE Racing Hard Charger, advancing 10 positions to finish in 14th. 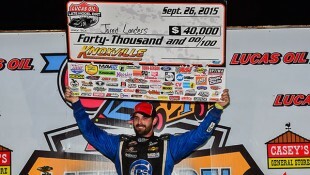 CONTINGENCY WINNERS – MSD Ignitions ($25 cash): Jacob Allen; MSD Ignitions ($50 cash): Joey Saldana; Sweet Manufacturing ($50 cash): N/A; Penske Shocks ($50 cash): Logan Schuchart; Mobil 1 ($50 cash): Shane Stewart; JE Pistons ($50 cash): Shane Stewart; Lincoln Welders ($50 cash): Shane Stewart; VP Racing Fuels ($50 cash): Kerry Madsen; Edelbrock ($50 cash): Logan Schuchart; Comp Cams ($50 cash): Donny Schatz; Cometic Gasket ($50 cash): Kyle Hirst; Super Flow ($50 cash): Jason Sides; Sweet Manufacturing ($50 product certificate): Daryn Pittman;KSE Racing Products ($100 product certificate): Jason Sides; Comp Cams ($50 product certificate): Daryn Pittman;Mobil 1(20% off Mobil1RacingStore.com): Jason Johnson; JE Pistons (Set of Rings): Bud Kaeding; JE Pistons (Set of Rings): Jacob Allen. 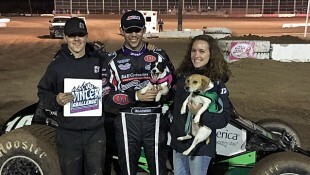 SEASON WINNERS: Donny Schatz – 29 (Volusia Speedway Park on Feb. 14, Stockton Dirt Track on March 21, Silver Dollar Speedway on March 28, Placerville Speedway on April 8, Calistoga Speedway on April 12, Devil’s Bowl Speedway on April 26, Eldora Speedway on May 8, Eldora Speedway on May 9, Williams Grove Speedway on May 15, Weedsport Speedway on May 17, The Dirt Track at Charlotte on May 22, Knoxville Raceway on June 13, Huset’s Speedway on June 14, Granite City Speedway on June 17, River Cities Speedway on June 19, Dakota State Fair Speedway on June 20, Beaver Dam Raceway on June 27, Lakeside Speedway on July 1, Dodge City Raceway Park on July 4, Cedar Lake Speedway on July 11, Lebanon Valley Speedway on July 26, Federated Auto Parts Raceway at I-55 on Aug. 8, Knoxville Raceway on Aug. 15, River Cities Speedway on Aug. 21, Nodak Speedway on Aug. 23, Castrol Raceway on Aug. 28, Grays Harbor Raceway on Sept. 7, Cottage Grove Speedway on Sept. 9, Silver Dollar Speedway on Sept. 12); Shane Stewart – 9 (The Dirt Track at Las Vegas Motor Speedway on March 5, Keller Auto Speedway on April 17, Salina Highbanks Speedway on May 1, Crawford County Speedway on June 12, Eldora Speedway on July 17, Eldora Speedway on July 18, Federated Auto Parts Raceway at I-55 on Aug. 8, Skagit Speedway on Sept. 5, Silver Dollar Speedway on Sept. 11); Daryn Pittman – 5 (Volusia Speedway Park on Feb. 13, Antioch Speedway on March 29, New Egypt Speedway on May 19, Castrol Raceway on Aug. 29, Antioch Speedway on Sept. 13);Brad Sweet – 3(Volusia Speedway Park on Feb. 15, Calistoga Speedway on April 11, I-96 Speedway on June 25); Rico Abreu – 2(Thunderbowl Raceway on March 14, Stockton Dirt Track on March 22); Dale Blaney – 2 (Attica Raceway Park on May 29, Lernerville Speedway on July 21); Paul McMahan – 2 (Perris Auto Speedway on April 18, Tri-State Speedway on May 3); Joey Saldana – 2 (Kokomo Speedway on June 3, Cedar Lake Speedway on July 12); Christopher Bell – 1(Federated Auto Parts Raceway at I-55 on May 2); Brian Brown – 1 (USA Raceway on March 7);Cody Darrah – 1(Lernerville Speedway on July 21); Danny Dietrich – 1 (Williams Grove Speedway on July 25);Stewart Friesen – 1(Ohsweken Speedway on July 28); Greg Hodnett – 1 (Lincoln Speedway on May 13);Tim Kaeding – 1 (Thunderbowl Raceway on March 13); Danny Lasoski – 1 (I-80 Speedway on June 5); Kerry Madsen – 1 (Junction Motor Speedway on Aug. 18); Terry McCarl – 1 (The Dirt Track at Las Vegas Motor Speedway on March 5); Jason Sides – 1 (Dodge City Raceway Park on July 3); Stevie Smith – 1 (Williams Grove Speedway on July 25). 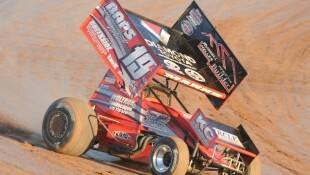 The World of Outlaws Sprint Car Series is brought to fans across the country by many important sponsors and partners, including: Lincoln Welders (Official Welder), Bad Boy Buggies (Official Side-by-Side Vehicle), The Kenny Wallace Dirt Racing Experience (Official Racing Experience), Hoosier Racing Tire (Official Tire), VP Racing Fuels (Official Racing Fuel); in addition to contingency sponsors, including: Cometic Gasket, Comp Cams, Edelbrock, JE Pistons, KSE Racing Products, Mobil 1, MSD, Penske Racing Shocks, Sweet Manufacturing, and Superflow Dynos; along with manufacturer sponsors, including: ButlerBuilt, Intercomp, Impact Race Products, Racing Electronics, S&S Volvo and TNT Rescue.